The people who brought Bleu Bohéme to Kensington have teamed up with the Cohn Restaurant Group to transform what used to be Thee Bungalow into a "casual neighborhood bistro" reminiscent of Provence, called BO-beau kitchen and bar. The "BO" stands for "Bohemian." Bleu Bohéme's web site states: "Bleu Bohème is designed to create a feeling of France's past generations. It mixes the Bohemian and Artistic free spirited Left Bank of Paris with the roots and tradition of the Rural Areas. 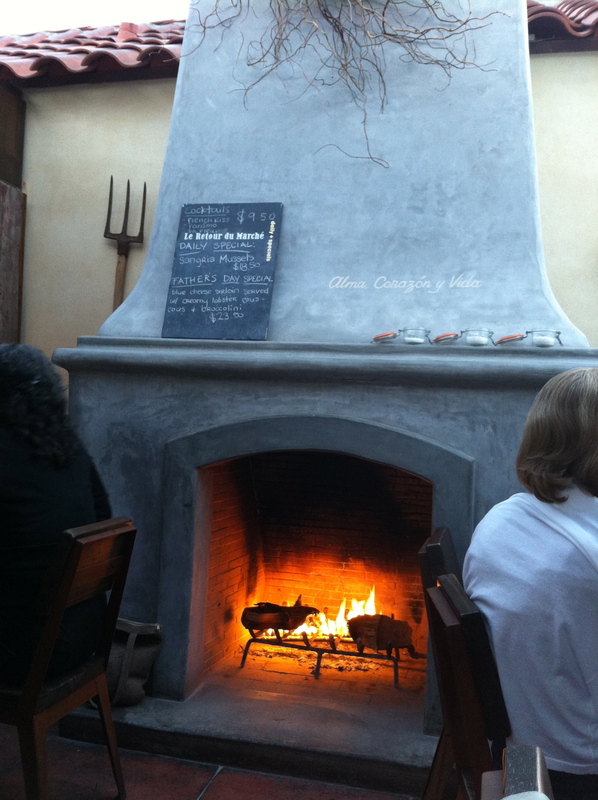 Bleu Bohème is a neighborhood restaurant that serves accessible, affordable and comforting French Cuisine." This could just as easily describe BO-beau. But let's get to the good stuff. It was fun how wines by the glass were placed in four categories: Cheap, Decent, Good, Very Good. But we started off with a cocktail (pictured below) is the one I got, the Le Bohemien, with St. Germain elderflower, rum, mint, and lime juice. Light, refreshing, delicately boozy, it was the perfect way to transition from the stress of the day and get me in the mood for trying out a new place. Our server strongly recommended we begin with the crispy brussels sprouts, and I'm happy she did -- pancetta, shaved parmesan, and balsamic made them savory and salty with a hint of sweet. Up next was probably my favorite bite of the evening -- a "woodstone oven flat bread," with goat cheese, curry onion jam, crushed red peppers, and jalapenos. Despite how scrumdiddilyumptious this was, I would have preferred the jalapenos be cooked or blackened, rather than sliced and place atop the bread as an afterthought. I picked them off (they're more painful than tasty to me in that state), but enjoyed the sharpness they left on the beets. 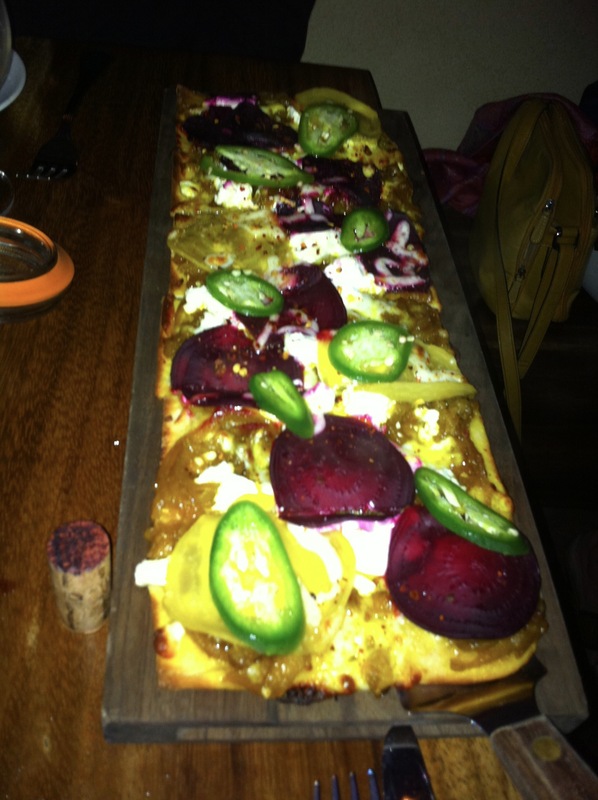 But jalapeno preferences aside, this flatbread made me moan. I'm sorry the picture is so poor, the flash on my iPhone leaves much to be desired. I was happy to see wine from Vacqueyras, a small town in Provence I just visited last year. For nostalgic purposes, David and I had to order it. Light, smooth, easy drinking, with a bit of a peppery finish, it was perfect for what I had, but David ended up ordering a meatier zinfandel later to go with his steak. Speaking of which, David absolutely loved his rib-eye steak and frittes. He asked for medium-rare, and not only was it cooked perfectly for that request, but the cut of meat itself was well-trimmed, both tender and flavorful but free of gristle. The frittes were also excellently executed, crunch on the outside, soft on the inside, with a complimentary but not overwhelming flavoring of rosemary and salt. My least favorite item on the table was the entree I ordered, the housemade fettuccini, with duck confit and roasted mushrooms in a parmesan reduction. The flavor was good, but one-dimensional. The pasta was overcooked, and over all, after one or two bites, it was just too rich. This dish could do with a bit less sauce, and the clarification of flavors -- I couldn't even tell the difference (aside from texture) between a piece of mushroom or duck. We were way too full (even with our boxes to go) to think about dessert. But I liked the feel of the place, the service was great and the food (save for one dish) impressed us (not an easy task for a couple of world traveling foodies). We will be going back to try more dishes, and probably soon. casandiego1 Sept. 14, 2011 @ 9:04 a.m.
Brussel sprouts TO DIE FOR, an extravanganza of flavors. Mac 'n cheese creamy and delicious, had the rest for breakfast the next day, it was so good. Considering the meticulous attention to flavor and presentation, I was kind of surprised to get a juice glass for my wine though ! Barbarella Fokos Sept. 14, 2011 @ 9:53 a.m. Yes, they are, love that dish. Haven't tried the mac 'n cheese though, now I'm curious. Thanks for the tip! :) Oh, regarding the wine glasses, that's how they serve wine in the country regions of France and Italy. I actually have some tumblers at home I brought back from Italy, made of clay, and every so often, I use those to drink my wine with dinner. It's part of the charm, and authenticity of the decor to the region.